Access the Timeless platform to get radiographic interpretation. Click here to radiographic interpretation Diagnostic imaging is an important tool in the diagnosis of many of our pets’ diseases. The imaging tools used at the DMV Center are digital radiography, ultrasonography, fluoroscopy, CT-Scan and magnetic resonance imaging (MRI). These methods are used under the supervision of Dr Hugo Joly and Dre Kate Alexander with support from our certified animal health technician Kiran Sheihk. The diagnostic imaging department also works in close collaboration with the emergency department’s veterinarians and our other veterinary specialists. A referral radiographic interpretation service (partenariat Radio-Vision DMV) is available to general practitioners wanting some help with more challenging cases or eager to explore other diagnoses. A referral ultrasound service is available by appointment to general practitioners wishing to directly refer a patient. In addition, in-house ultrasound and radiographic interpretation are available for hospitalized patients. 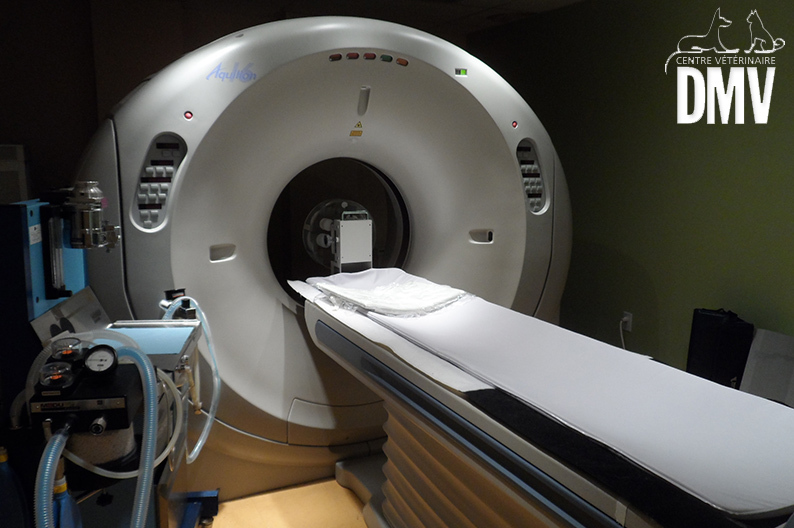 MRI and CT scans are also available for in-house patients. Ultrasonography is most frequently used to investigate the abdomen, but it can also be used to evaluate other anatomic regions such as the thorax (non-cardiac), the cervical region (including thyroid imaging), the musculoskeletal system and most of the body’s soft tissues. During ultrasound examinations, fine needle aspirates and biopsies can also be performed to obtain a final diagnosis. CT-scanning is done under deep sedation or general anesthesia and is used to diagnose or follow the progression of many diseases, such as complex fractures, vertebral disc herniation, nasal cavity diseases, chronic otitis, pres-urgical mass evaluation and whole-body scanning for staging of cancer patients. MRI is also performed under general anesthesia and is mostly used for brain and spinal cord injuries and diseases which can be responsible for neurological symptoms.